The bands were hot and the dodgeball was even hotter at the first-ever Ultimate College Weekend at the Pepsi Arena in Albany, New York. With two tournaments, one on Saturday and one on Sunday there was plenty of dodgeball action for those who attended the event that drew students from around the New England area. On day one, it was an evenhanded tournament with almost every match coming down to the final game. When a team from the Geek Squad issued a challenge against the U.S. Army Team, the challenge was answered. 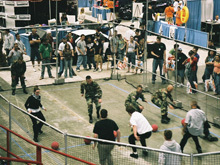 Fans were left stunned as the Army guys were sent packing by the hard throwing Computer Agents, who proceeded into the semi finals. In the end, however, it was the unassuming Average Joe's who took down the Geek Squad and ultimately the tournament victory. On day two, the pace was fast and furious and the teams came ready to play. The U.S. Army was back with a new team to reclaim their honor, and a new all women's team entered the fray. Team Philmonteans returned and right away stood out as the team to beat. The U.S. Army team looked great and held in there longer than their counterparts did on Saturday, but ultimately the Philmonteans brought them down after five tight games. The crowd went wild as the Power Puffs, the crowd favorite, beat the Shockers early on. The Shockers rallied and eventually moved on. Team Philmonteans however proved to be too much for any team. They they flashed around the court, knocking off one team after another as they advanced to winner's circle.